Andrea's World Reviews: #KrystalBETsweeps Win a VIP Trip to the BET Experience! #KrystalBETsweeps Win a VIP Trip to the BET Experience! I'm sure you all know how much I love food. 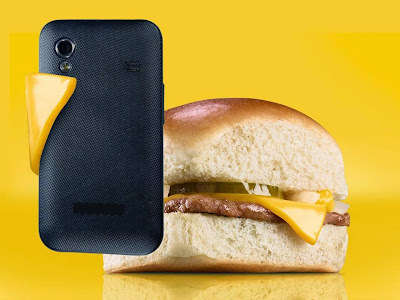 One of my favorite fast food restaurants, Krystal, is giving me a reason to love it even more. 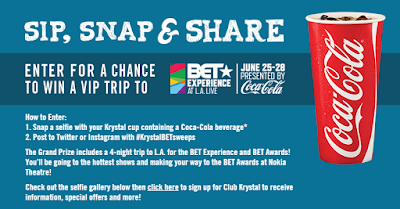 From now through May 27th, if you visit Krystal and take a selfie with your Krystal cup and post t to Facebook and/or Instagram with the hastag #KrystalBETsweeps, you will be entered to win a VIP trip to the BET Experience! If you eat at Krystal, you are already a winner in regards to getting a fantastic meal, but who doesn't love winning prizes? And a VIP trip to the BET Experience is the creme of the crop of prizes. Anything VIP is awesome. I know I will be visiting Krystal to enter the sweepstakes. Okay, so the sweepstakes is just my excuse, I would go to Krystal anyway. As if the BET sweepstakes was not generous enough, Krystal has also be so kind as to allow me to give away 4 Krystal Meal Cards to one very lucky winner. Enter via the Rafflecopter below for your chance to win this delicious prize. Good luck!